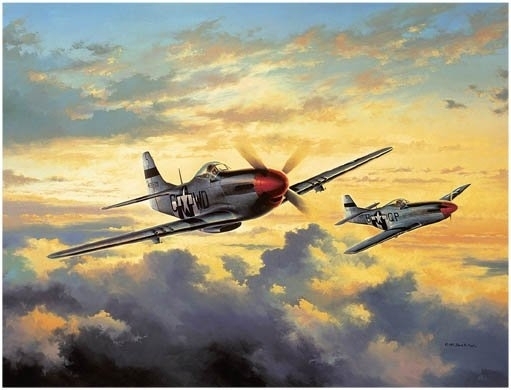 Overall Print Size: 31" x 25½"
Depicted are P-51 Mustangs of the Fourth Fighter Group, led by Colonel Don Blakeslee, which was one of the most successful P-51 groups of World War II. With their first pilots coming from the RAF American Volunteer Eagle Squadrons the 4th Fighter Group was credited with more than 1000 German aircraft destroyed. Colonel Don Blakeslee, who flew more combat missions as a member of the Eagle Squadron and the 4th Fighter Group than any other allied pilot during World War II, is shown here with fellow 4th Fighter Group pilot Colonel James Clarke.